What is the exclusive content for patron? On the Patreon platform, why not use "per creation" but instead use "monthly"? How to become a patron in Patreon platform? Why do you choose Patreon over other platforms such as Indiegogo or PayPal to collect funding? What is High DPI mode? So your "free software" isn't free after all? Can I download trial version? What are other software enhancement planned? How to activate Community NVR Software? What does the "(in development)" mean in the rewards description? What does "Quota exceeded" mean in the Community NVR list? How to activate NVR Community License? I have a farm where Internet connection isn't always available, can I use Community Edition? Do I need persistent Internet connection to use Community Edition? What is Patron Credit Level (PCL)? For the Community Edition NVR software, what does it really mean when you say "non-commercial-use-only"? Step 1. Click "Get Software" button. Step 2. A pop-up will appear. Click "Get Software" item. You need to become a patron get obtain download URL link. Step 3. You will be redirected to Patreon platform, which is a popular platform for creative crowdfunding. Click "BECOME A PATRON". Step 4. Select a patron pledge. To us, of course the higher the better. Minimum $5.00+per month will get you a download link. We will appreciate your contribution to become a patron. Step 5. After completing payment information, the URL link will be unlocked. Step 6. You will be redirected to a login screen. Please select "Sign-in with Patreon". Step 8. You will be presented patron-exclusive downloads. Please continue to support us and play fair. Software development and maintenance is an expensive work, and it costs an entire software team hundreds hours of work every month in order to do it right. Through the years of business development, we found the majority of users have chosen to utilize our free-for-noncommercial edition of "NVR Software Community Edition" software, to replace the need for license fee payment to Genius Vision. Although it is our clear knowledge that in fact, many of those users are actually applying our software into commercial scenario, we don't have an actionable plan against those users. Add support to High DPI mode. We want to continue to enhance our software to benefit you, but we need your help to do this. This "Patreon integration" direction change gives our team a new hope for a better tomorrow. Please consider to appreciate our creative effort by actual action -- to become one of our patron. Even a patronship of $1/month is a great encouragement to us, and we will be very appreciated to your contribution. Also you will get our exclusive content. We are trying various way to increase our revenue. If you have any suggestion, please do tell us. Also, if there are some features that you hope that Genius Vision NVR to have, please also tell us. We will appreciate your input. Unfortunately at current stage, the answer is "No". But it doesn't mean it's not possible in the future, as we will explain more below. These rewards are in preparing and will be released soon. In the meantime, with your encouragement, the process will be expedited. We've set the goal that when reaching $20,000+ per month, we will authorize Genius Vision NVR CmE to be used outside non-commercial context for patrons. Before reaching the goal, all "non-commercial only" restriction still remains. In order to apply on commercial context, you'll need to use Commercial Edition instead, and purchase commercial license. A very different aspect of software development from other type of creation is "maintenance". Meaning if you have 1000 features, adding 1 feature can cause bug in the existing 1000 feature. Thus, in order to add 1 feature, the effort of making sure previous 1000 feature still working, is not trivial. Since what we primarily need is "monthly revenue", we have to put the one-time revenue on a lower priority. Also, software development is a "full-time job". It's a bit different from "artists". As software engineers, we must be constantly focusing our brain on this software knowledge. If we just "occasionally" do the software development, then we're afraid the knowledge will soon decay and the software will be containing a lot of bugs. Many users appreciate our software is because our software is very stable. From the engineering point of view, it means we must have high-quality and strict coding and testing process. It could not have been achieved without a full-time dedicated software development team. An interesting story to share is when I used to work in another company (that is also doing video surveillance software) many years ago, we had many customers asking us to add a lot of software features. At that time, that company didn't have very strict control of coding like what we have now (as most of software company in the world did), the software soon became very unstable. It crashed too often to a stage that the customers couldn't bear it anymore and shout out that "I don't want anything fancy at all, not anymore! I just want your software to record 24x7 without fail. I just want this single feature!!!". Ironic, right? Achieving the simple 24x7 running, turns out to be the most difficult task at all. When I was at that company, we never had the chance achieve that goal because the problem was in the architecture and methodology. There was no way to fix the problem unless we restart the software development from the ground-up, and back then this was not an option. It's fortunately that I turned out to start-up my own company, so I'm able to develop the high quality software like what we currently have. This is a story that tells you about the importance of "software maintenance". Step 1. You might be redirected the Patreon platform, which is a popular platform for creative crowdfunding. Click "BECOME A PATRON". Step 2. Select a patron pledge. To us, of course the higher the better. We will appreciate your contribution to become a patron. Step 3. After completing payment information, the URL link will be unlocked. Step 4. You will be redirected to a login screen. Please select "Sign-in with Patreon". The purpose of Patreon is adopting the concept of "crowdfunding". Also, because we watched the "in the nutshell" YouTube series, and was deeply inspired by the creator, who highly recommends the Patreon platform. The aim is to utilize a big advantage our NVR Community Edition has, is that we have "many" users, who may not be able to pay very much. We have tried the "Indiegogo" platform before, but it seems unfit for our working model. As explained in this article, our strength is at "software development & maintenance". In a general type of crowdfunding, almost no one will pay for this "strength". Stereotyped crowdfunding projects, besides of Patreon, often emphasize on something that is very "glamorous" (or has a glamorous cause), or at least appear to be beneficial in an obvious way. A piece of IP video software that contains many complicated professional features, like ours, is nowhere near that definition. Also, we want a reputable platform to back Genius Vision up. We want a framework like "paying small while continuous", and someone to advertise that idea, so that we won't have to do it ourselves. Most often, advertising some concept is the most difficult task. Our primary focus should be on advertising our software and its benefits, so we'd prefer someone else to advertise the patron-like framework and concept, so we can just use it. After research we found Patreon to be a great fit, but of course if anyone has better suggestions we are open to other possibilities. As display technologies advance, manufacturers have increased the number of pixels supported by their displays. While text, images, and user interface elements look much sharper and more readable on high resolution displays, the operating system must scale up to support the visual experience; otherwise, everything just looks smaller. It will be free again when we completed the planning and repackaging. Right now you can download Commercial trial at http://geniusvision.net/. Remember that nothing is truly free in the world. Genius Vision Community Edition has been released free for non-commercial use for over 7 years since 2010. Now, because of the reason explained here, we have to make some kind of adjustment. Very soon, after the strategy is confirmed it will be announced, and the new free version will be released. The packaging of the new version will be largely depend on the experiment result (that how people will become patrons) in these days. Thank you very much for your continued support for Genius Vision software. We'd like to share our experiences up to now, that since we joined the Patreon platform initially at 2017/12/15. We performed some experiments thereafter and has formed some rough initial ideas about our future strategy. Also we'd like to explain why the so-called "free nvr" CmE is not able to be downloaded freely for the time being. Greetings! We'd like to share our experiences up to now, that since we joined the Patreon platform initially at 2017/12/15. In order to really do this, modifying the NVR software itself to be tightly integrated with the Patreon platform is necessary. This takes time, and it also takes the right strategy. Modification software is a lot of work no matter how you do it, so we need to collect some measurable data before deciding what is the correct strategy. To do that, we need to perform some experiments. So below we'd like to share some experiences about these experiments so far. The first and the most important question, to us, is very simple and straightforward: "Does this Patreon platform really work? (Does someone like us really get paid on this platform?)". Subsequently, more questions like "How will someone likes us to raise fund? How much will this get us? Will it be sufficient to support a professional software development team like us?" etc, arised. Well, it seems like a lot of questions because we're new to this concept. Patreon platform is not like most other crowdfunding platforms, which mostly require a glamorous and obvious goal to work. It just might work for us. However, the small-amount nature hinted us that it might not be enough to support a professional software development team like us, well at least not enough at the first few months, because the momentum is yet to be gathered. About this point, we have decided to separate our Commercial Edition away from this project. So all CmE we talks from now, will still be under non-commercial use (See: main article). Q1: Does someone like Genius Vision really get paid on this platform? Q2: How much will this get us within what kind of timeframe? To answer Q1, we did an experiment, that starting from 2017/12/15, we started to put a "Help us to grow" button beside the "Download software" button. At that time, the 930 CmE software can still be downloaded just by clicking that button. To our surprise, after 4 days, no one has chosen to become our patrons. If this situation continues, all subsequent experiments, and effort toward Patreon platform won't mean anything at all. At that time, we couldn't tell if we were not doing this the right way, but we had to make a change to this experiment, one way or the other, otherwise the entire project fails. At 2017/12/19 19:30 (GMT+08), we moved the 930 CmE software download link inside patron-only content. To our surprise, again, just one hour after we doing this, we got our first patron, Mr. Steve (thank you very much, Mr. Steve). Although it was only $1/month, already this was a huge encouragement to us. Since then, we had received about 3~4 "disgruntled" users, who were "seriously complaining" why they couldn't get the free software, as advertised by the "Best NVR, for free" wordings. Well, I admit for the time-being, the wordings could be misleading, so we have written an explanation. Nevertheless, to these disgruntled users, the explanation seems to mean nothing at all. Our CmE will eventually be free again, but will, obviously, need to be be under different packaging. As the similar reasoning to the "3-button" experiments mentioned above, if the freely available CmE is too powerful that satisfies everyone's need, then it will be very difficult to gather more patrons. That is, there is "no need" for people to put the idea of "becoming patrons" in their heads. I guess it can't be helped. With all the good intentions the Patreon platform tries to advertise, it's still a product under the social framework of capitalism, and so is its audiences. Thus, to make CmE over Patreon platform really work, we need to differentiate our CmE capability, and make it different to free users, and to various level of patrons. Also, in order to be able to gather sufficient number of patrons, the free version need to be "insufficient" by definition, while favoring patrons with more powerful software capabilities. After the patron-integrated CmE is released for free-to-download again, we can make more exciting software enhancements, based on this arrangement. That's all for now, I hope it's not too long (don't read). We'll be releasing more updates soon. With that being said, please become our patrons at anytime to give us more encouragement forward. This packaging is the inactive. Effectiveness started from 2017/12/15, ends at 2018/1/12. Active patrons started before 2018/1/12 still enjoy this plan. The NVR software and Patreon integration is still under development. ➤This tier and above can always download latest version of CmE software. Allows to use 16-Channels for single NVR server. Non-commercial usage only. Allows to use 32-Channels per NVR server, up to 3 servers. Non-commercial usage only. ➤This tier and above can always download archived version of CmE software. Allows to use 64-Channels per NVR server, up to 5 servers. Non-commercial usage only. This packaging is the currently active. Effectiveness starts from 2018/1/12. Allows to use 2-Channels. Non-commercial usage only. Without Patron+ features. ➤In free tier, software download might not be always available. Available hours will be announced. Allows to use 4-Channels for single NVR server. Non-commercial usage only. With Patron+ features. Allows to use 16-Channels for 3 NVR server. Non-commercial usage only. Without Patron+ features. Allows to use 16-Channels for 5 NVR server. Non-commercial usage only. With Patron+ features. Allows to use 16-Channels for 10 NVR server. Non-commercial usage only. With Patron+ features. Allows to use 32-Channels for 5 NVR server. Non-commercial usage only. With Patron+ features. Allows to use 32-Channels for 10 NVR server. Non-commercial usage only. With Patron+ features. Allows to use 64-Channels for 5 NVR server. Non-commercial usage only. With Patron+ features. Allows to use 64-Channels for 10 NVR server. Non-commercial usage only. With Patron+ features. Before using the join link, make sure you have read the entire guidelines written below. 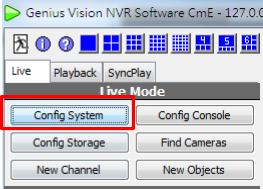 Genius Vision NVR Community Edition is released under free-for-non-commercial-use for 7 years. We are changing it since 2017/12/19, so you wouldn't be able to use it like it has always been. There is a reason for this, and this is a temporary measure. The aim of this channel is to discuss how to increase the revenue of Genius Vision so that our continued support to this free software is possible. With that being said, this is not really a "chat freely" channel. All things said are still under admin-moderation. We need to keep language clean and keep discussion productive. If someone just want complain without any constructive suggestions, we wouldn't want that. The langauge guideline is at followng section. Also, we need to concentrate on the topic a channel is designed for. Aimless discussion is not productive in any situation. In the forum, we will direct the topic of discussion, please follow the discussion, and try not to control it. Please also scroll up the chat history and try not to ask duplicated question that has been repeatedly answered before. 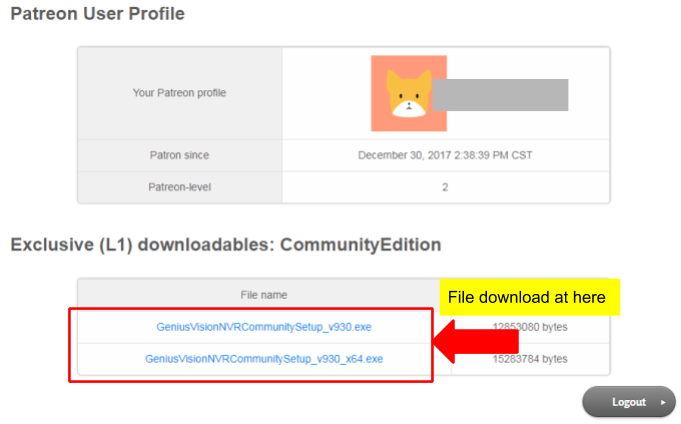 Also, if you just want to try the software in full function to see if it fits your need, please download our commercial free trial edition at http://geniusvision.net/ or (64-bit at http://geniusvision.net/nvr-enterprise-x64.html). You can try this full-function commercial software for 30 days freely, without having to become any patrons. There is almost no functional difference between the trial edition and the Community Edition. The language rules of the #general also apply in this channel, specifically: do not use languages of "high frequency" or "strong demand" to disrupt the order and focus of the forum. To put simply, I think it's safe to assume most people come here don't know each other personally. In a way we are all strangers coming together to discuss a common interested topic. We'd expect the same politeness you would give to any other strangers. I mean, you wouldn't go in front of a stranger, who doesn't owe you anything, and say: Hey stranger, I need you to do this for me! Why don't you do what I want? Why would you do something I don't want? If you don't do what I want you to do, I will say something bad! ", or something like that, would you? If you would, you are generally not considered to be a polite person, and therefore will not be treated like one. In that case, we might try to give out some warning before issuing a perma-ban, but in our experiences, some users are set out to use bad languages so warning seldom works. If we can all respect each other, we can live with different opinions. Please kindly keep in mind that, if something is free, then no one owes you anything. Happy new year everyone. We'd like to share some update about NVR-Patreon integration. Primarily, the updated packaging and reward restructure has been decided and is scheduled to be announced soon. We'll also explain our rationale behind the change. Pre-existing patrons will enjoy same rewards at the time they become our patron. First of all, we'd like to inform everyone that we have successfully received our first cycle of payment from the Patreon platform at 2018/1/1. What a significant day to Genius Vision! The amount is $43.35 USD in total. I know for a development team like us, this kind of amount isn't really a "helping amount", but it represents the support from our users which gives us strength to move forward. So we are genuinely appreciated. This "actually receiving cash" step is very important to us, because it helps us to understand the entire process the Patreon platform has presented to us, from creator page design, writing, recruiting patrons, and actually receiving payment. From this perspective, we have just completed the necessary verification for the Patreon platform. Here we like to thank everyone who has participated the patronship in the Dec. 2017. However, there are some new facts that we discovered during this process that was previously unknown to us. One of them is the so-called "transaction overhead". Of the $43.35 actual payment we received, an additional 14.72% of the cash is deducted by the Patreon platform (not counting another 5% Patreon platform fee, according to its dashboard as shown below). According to Patreon platform's explanation, the high percentage of "processing fee" is caused by the small-value transactions, particularly the $1 (or $2) transactions. For payment platform like PayPal or credit cards, the payment platform itself set a minimum per-transaction fee. As a result, the more small-value transactions we have, the more the "transaction overhead" will be incurred. I guess this is quite straightforward like physics laws. We just have not thought about this earlier, because, well obviously we are new to this Patreon platform. I guess that's why I've read somewhere that the average patron's contribute is about $10/month in the Patreon platform. If the campaign is properly arranged that makes each transaction become average $10, then the transaction overhead will become negligible, and the distance to our goal will also be shortened significantly. Shortly within one week after receiving the first cycle payment, another unexpected thing happened. Although new patrons still coming in on daily basis, on the other hand, slowly, some patrons (especially $1 ones), are leaving. As a result, the patron amount stuck at certain point. This is a unfortunately phenomen, because it shows that part of our small-value patrons has the tendency to be patron for only one cycle. For those users, $1/month means exactly $1, not /month. It clearly means these users "strongly want to use our software, but strongly don't want to pay". They are paying because they are compelled by our current policy. Our current policy states that "minimum one cycle of $1" is required to download the CmE software package, and this is exactly what they were willing to offer. This fact completely changed our plan, because in our original thought, if we accumulate enough number of $1 patrons, then the number will still be good and the goals will still be within our reachability. Now, it would seem the situation isn't anywhere near what we have imagined. It seems that allowing $1 to download CmE ironically opens a gate for those who are "forced to pay" to become our unwillingful patrons. Those users are, for the lack of a better word, pretty "counterproductive" from the viewpoint of Genius Vision. But this is just from the viewpoint of our new business plan. I still thank everyone who has ever became our patrons, even including those $1 users. So we're not being unthankful here. It is just a fact we observed. Careful obversation during this period is essential for developing our future plans. Later on, a concensus has formed inside Genius Vison team, that maybe we should raise the download patronship barrier to $5/month. Although for those "forced patrons", it's only $5, not /month, but for people who actually wants to be our patrons, the $5/month is still way under the average patronship in the platform (which is $10/month). We need our patrons to be in the right mindset, and $1 (with only one month) patrons is "not at all" what we are looking for. Please become our patron, only when you want to. If one feels "compelled" to become our patron by our current patron-download policy, then it means one may have some kind of urgency to apply our software. In this case, maybe what one really needed is the Commercial Edition, because for personal-use, there is seldom any "urgency" that one must be compelled to be $1/month patronship (and not very willingly so one must withdraw the patronship right after the minimum 1 month cycle). In order to avoid the compelled patronship and to recruit patrons in the right mind, raising download barrier may be the only way. Small-value (such as $1 or $2) transactions incur much higher transaction overhead. Small-value download barrier opens a gate for unwilling users to become our patrons and immedately withdraw their support after minimum one cycle. The updated packaging and reward restructure can be looked-up here. This revision primarily removes all reward layers under $5. Also, we added "software downloadability descriptions". To summary, in the V1 plan, $1/month or above will grant you to download the latest version of CmE package, while $5/month or above will grant you download the archived version of packages. In the V2 plan, however, $5/month or above will grant you to download the latest version of CmE package, while $10/month or above will grant you download the archived version of packages. Another main point is that we introduced a Patron+ attribute to each patrons. To simplify, each patron either have this Patron+ attribute, or doesn't have. Pre-existing patrons are considered to have this attribute. This attribute is much equivalent to the "Lite vs. Professional" difference in the commercial packaging, so it will be easy to understand. A noteworthy addition in the V2 plan, is that we designed in the free tier, "Software download might not be always available. Available hours will be announced. " As a free software package, download requires bandwidth and server maintenance. Since free users don't want to share any cost at all, the availablility will not be always-on. We consider this to be pretty fair. In that way, disgruntled user can't claim that "free NVR is not really free". Well, it's free, just not always available for download. So, if one want it to be "always available for download", then patronship $5/month is required. We have released Community Edition version 960 at 1/31 for free download. Let's see how everything goes, cheers! The biggest news is that we have released Community Edition version 960 at 2018/1/31 for free download. This version complies with the Version 2 reward structure. Therefore the free-tier will have 2-channel without Patron+ function. We also designed the Patreon-backed NVR trial that allows users to try out what will be rewarded before actually becomes a patron. Users who already became our patrons can also claim their rewards in this version of NVR software. To deal with the "offline license" issue, we also designed the Patron Credit Level (PCL) mechanism, that will address the concerns of some users who might want to apply our software on a distant farm that doesn't have a persistent Internet connection. 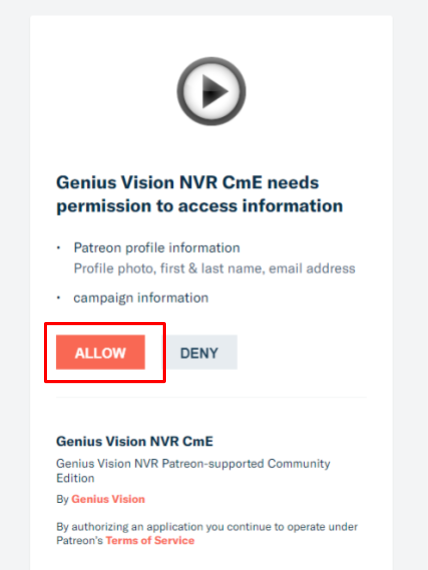 To properly support the occasionally connected NVR installation, one will need to prepay a one-time-per-pledge PCL fee directly to Genius Vision. After that, the offline license is possible to some extent. Currently maximum consecutively 30 months is supported. For the current time being, we open the Community NVR version 960 for free download, without any strings attached. Exactly like the good old days, before 2017/12/19. In the meantime, we will continue to observe the activity of people joining (or leaving) our patronship. If everything goes well, meaning people are steadily joining our patronship, the free download will be continued. Otherwise, we may have no choice but to revert to the "three buttons" scenario, where the loving free download will be blocked in some less-than-pleasant way. I hope we can all work together to a brighter tomorrow. This is a place holder for new software enhancement planned. More simple way to support multi-monitor. Recorded video together with real-time weather condition. Vacation schedule for trigger policy. The Patreon integration to Genius Vision NVR Community Edition is a fairly new development and direction of Genius Vision team. Some part of the rewards is still under development. The integration will be soon completed and be announced. If there are any input or questions, please utilize our chat room. Disable some of un-needed NVR records. 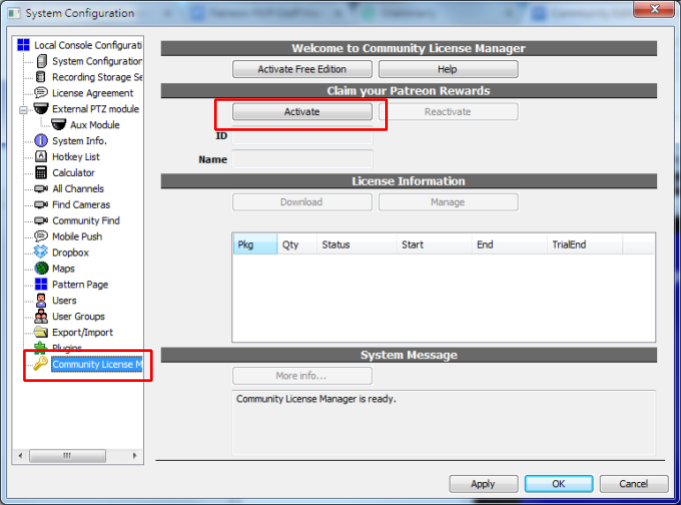 There are mainly two ways to activate NVR Community license. 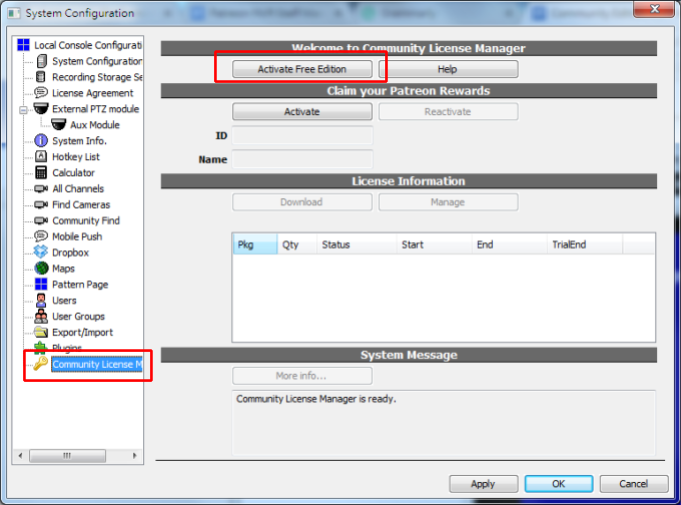 Firstly, you can click the "Config System" button and navigate to "Community License Manager", as the screenshot below. You will be given the two options, as explained as follows. Sure you can. You will need to create a Patreon account first. Before actually becoming our paid patrons, we allow users to try for the patron rewards for 15 days. In this case, only one trial instance is permitted. After trial period expires, it automatically converts to free edition. However, If you have already activated the free edition, this option will not be available. This is because you are considered "have tried" our software so it's time to pay. To re-enable trial on this occasion, complete removal of the software (including all its data) is necessary. Step 1. Click "Config System." console button. Step 2. 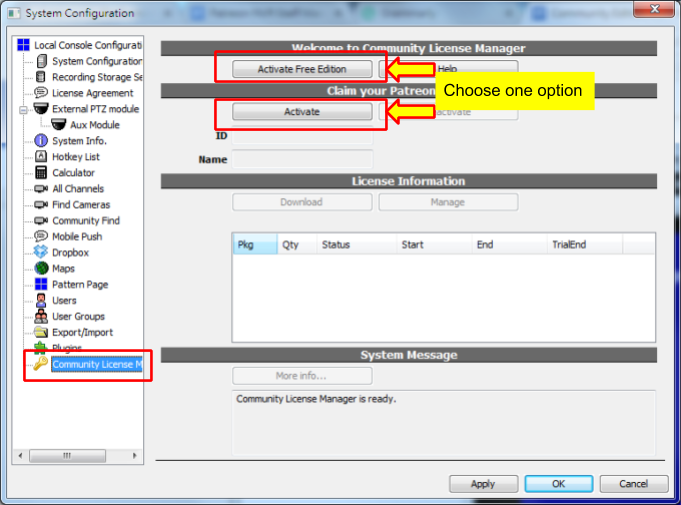 Navigate to "Community License" Manager, Please click "Activate Free Edition". Step 3. Your default browser will pop-up. 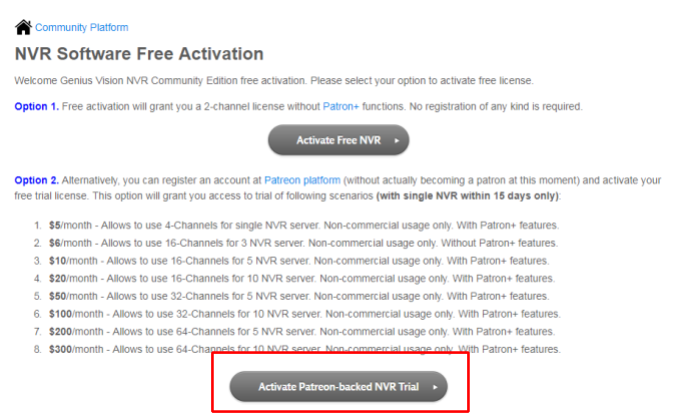 Please choose second option "Activate Patreon-backed NVR Trial"
Step 4. You will be presented your current Patreon profile. Click "Activate Trial NVR License"
Step 5. Select your trial type and click "Confirm activation". That's done! Step 2. Navigate to "Community License" Manager, and choose to claim your patron rewards by clicking "Activate" button. Step 3. You will be redirected to a login screen. Please select "Sign-in with Patreon". Step 5. You will be directed to the list of your NVR definition. If it's the first time, you will be asked to create the first record. Just input a "User friendly name" and click Create. Step 6. In the list, select the one NVR record you want and click Activate. Step 7. When confirming, click Confirm activation. Step 8. The webpage indicates completed successfully. Now switch to NVR software. Step 9. In the NVR you can see the License Information is properly downloaded. Your NVR is ready to use. In patron rewards, one NVR record basically represents one single computer of NVR software usage. 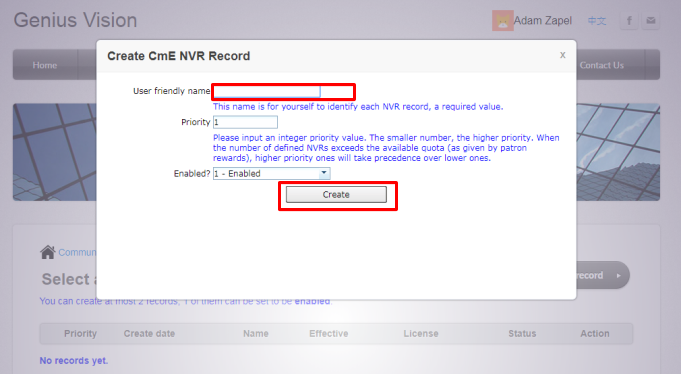 If you want to activate NVR software on multiple computers, you need to create multiple NVR records. A single NVR record can be activated no more than 4 times within 30 days and 6 times within 180 days. Both conditions must hold true for (re)activation to succeed. Step 2. Navigate to "Community License" Manager, and choose either to use "Activate Free Edition" button, or claim your patron rewards by "Activate" button. Generally speaking, Internet connection is required for the activation of license. After that, the free edition has 180 days of validity. The software automatically renews the license daily, so there is no practical time limit for free edition. However, if the Internet is severed the software will not be able to renew the license so it will expire after last known validity date. This 180 days validity is just an initial value we set for now. Depending on how people will join our patronship, it can be extended to 365 days or even longer. As for patron reward license, the validity is 5 days. It is defined so because a patron can cancel patronship at any moment. However if you are willing to pay a one-time-per-pledge PCL fee, it will be possible for you to use Community Edition in offline mode, for a long period of time. If you need to increase your PCL value, please contact us. Also, these validity ranges are not hard limits. Please join us on the chat to provide your input. As long as we can keep up our revenue stream, anything is possible. 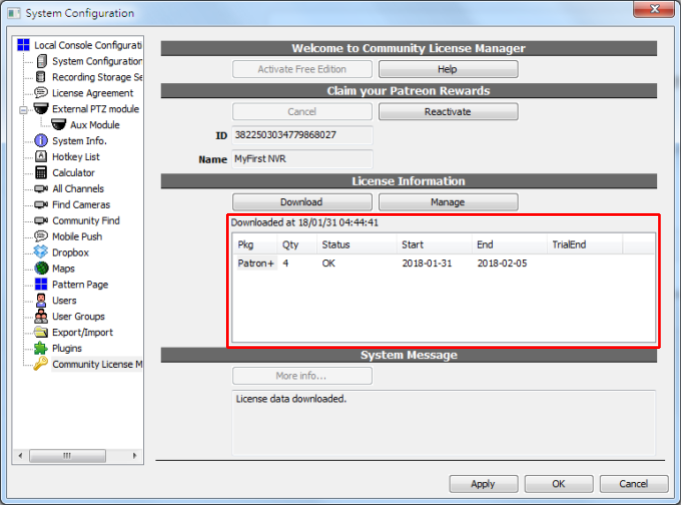 Patron Credit Level, or PCL for short, is a per-patron attribute, designed to resolve the "offline license check" issue that many users have indicated. By paying a one-time-per-pledge PCL fee, a user can extend this PCL value, and therefore solve the "offline license check" issue, to some extent. PCL itself is an integer value that can be roughly understood as the "number of future months" of license valid range before the user cancels patronship. All users' PCL value is initially zero. At the PCL=0 special case, the license will invalidate by itself if Internet cannot be reached within 15 days. If a user is a $P/month patron, by prepaying a one-time-per-pledge fee $P*N directly to Genius Vision, the user can increase N to his own PCL value. This PCL will remain valid as long the current pledge is valid. The moment a pledge is changed or canceled, the PCL associated with that pledge will be void. New pledge will need new payment to change PCL value. Currently, the maximum allowed PCL value is 30. To apply for increase of your PCL value, please fill out this application form. We will be in touch shortly. As one can probably picture, for the Patreon platform to be linked to Genius Vision NVR, as a license verification mechanism, then it's conceivable the NVR local installation must have a persistent Internet connection in order for this to work properly. This, however, will introduce the "offline license check" issue. For example, if a user has a farm located in the outskirt of the city, that only has "occasional" Internet connection, then online-license-check requirement might become a real problem. Let's say there is a patron called Adam, who subscribed the $5/month starting from 2018/1/1. At first, Adam's PCL value is 0 (zero) like everyone else. Adam then downloaded NVR software and activated the license at 2018/1/2. When the license is initially activated, the valid range is 2018/1/2~2018/1/16, precisely 15 days of range. The new Community License scheme is designed to check license status with the server every day. So when the Adam's NVR continue to be running at 2018/1/3, the valid range becomes 2018/1/3~2018/1/17, and so on. As long as the NVR have a persistent Internet connection, it will be always running, until Adam (hopefully not) cancels the patronship. At the moment the patronship is canceled, the license subscription immediately terminates. So, if Adam chooses to terminate patronship at 2018/1/5, the NVR server will be able to run at latest to 2018/1/6, at which timing the NVR will have already checked with the server and find out that the license is actually invalidated, therefore NVR function will cease to work. Adam can, however, choose to sever the Internet connection of the NVR right before he cancels the patronship at 2018/1/5. At that time, the license status is still 2018/1/5~2018/1/19. So as long as Adam keeps the NVR from reaching the Internet, the NVR will continue to work to 2018/1/19. In the above example, it shows that since Adam can cancel patronship at any moment, we have to treat Adam's credit level as zero. So as soon as Adam's patronship terminates, we want the NVR to cease to function as soon as possible. However, if Adam is willing to predeposit a credit level, this can be changed. This is where PCL (Patron Credit Level) come into play. Currently let us define that by prepaying N months of patronship directly to Genius Vision, the PCL value can be increased by N, only for the current pledge. If the pledge is changed or canceled, PCL will be voided. So following the example, if Adam pays PCL-5-months-fee, which is $5*5 = $25 directly to Genius Vision, Adam's PCL will be updated to 5 for the current pledge. Then, when the NVR license is activated at 2018/1/2, the valid range of the license will become 2018/1/2~2018/6/2. (Note this is an approximated example. We internally use 1 PCL=30 days. Here we use one month for easy-understanding). This means if Adam severs Internet connection and cancel patronship at 2018/1/5, the NVR will still be able to run to 2018/6/5. However, if Adam does not sever Internet connection, the NVR will still cease to function by 2018/1/6. Also, by canceling patronship, it will also make the previously paid PCL void. We think it is a fair and cost-effective way to deal with offline license checking issue. This payment is one-time per pledge. The maximum PCL currently allowed is 30. If more is required, please have a discussion with us. Step 1. Enter the Patreon platform Genius Vision, which is a popular platform for creative crowdfunding. Click "BECOME A PATRON". Step 2. Select a patron pledge. To enable extended function, $5/month or above is required. 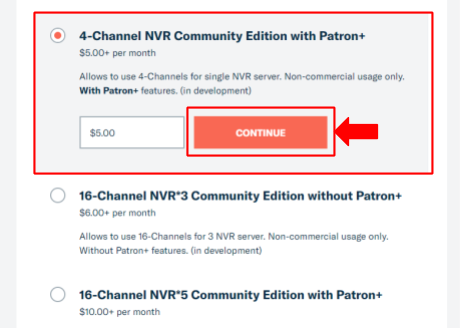 Contine your steps at: How to activate patron rewards in NVR Software? How to claim your patron rewards? Thank you for becoming our patrons. Following is a list of topics showing how to claim your patron rewards. Firstly, please download the Community Edition NVR software following this post. Install the software. You might need to know the default login at: What is the default account and default password? After the Community Edition NVR software is properly installed, activate the rewards according to the instruction: How to activate patron rewards in NVR Software? When I try to activate the license of the Community Edition, it shows as "INVALID"
The Community Edition, even when it is free, requires some hardware tokens for our license mechanism to lock on. One of the essential tokens to be locked on is the "hard disk ID". Without any detectable hard disk ID, the license mechanism may fail and therefore appear to be INVALID. We found that some users put all hard disks under the RAID system, and some RAID does not support detection of hard disk IDs. As a result, the software licensing subsystem cannot find the essential token to be locked on. This could be the cause of the problem. In order to resolve the situation, a workaround is to attach a physical disk directly to your computer (without being put under the RAID). Some users report adding a USB external disk also works, but we are not able to confirm it. Android APP crashes a lot, can you fix it? We found a major cause of Android crash is caused by problematic IP camera video bitstream (especially when processing of the bitstream require more memory than the phone has). Therefore the cause of the problem is not directly related to our software. Genius Vision was originally a piece of software that depends on a lot of third-party components to work properly. Therefore, when one encounters problems that manifest on the software level, we will be much appreciated if one does not try to blame the software first. We understand that from the point of view of a user, they see the APP crash so it looks like a fault of the APP, however, please try to imagine and compare to this scenario: if you cut the network cable, the software will also stop working, and there is absolutely nothing we can fix in the software that helps with the severed network cable . Genius Vision is a piece of professional software and require such knowledge to make it work. We understand it's a bit incompatible with the thinking of mobile APPs, but it's how it is. If users can try to understand that with limited CPU power both on Android side and NVR side, there is no chance that our software can " re-encode" the video bitstream. We have to accept the video bitstream as it is when it came out of the camera. Also, if the bitstream is originally damaged that causes the APP to crash, there really is nothing we can do. Can I move Patreon license to another computer? There's a limit count one Patreon NVR license record can be reactivated. It can be activated no more than 4 times within 30 days and 6 times within 180 days. If you reach the limit for a single NVR record, you may consider to upgrade your Patreon level, where more Patreon NVR records will be available. Use of the Community Platform will always be free. However, it takes human power to review user-submitted content. As the Community Platform has grown more and more popular, reviewing these changes takes significant human power. Some of the users may notice a prolonged waiting time before a change is approved by the administrator. This is because too many change requests has piled up in the queue, and we insist on maintaining the high review standard. Especially during these days, information such as default password could be used as an security exploit tool. We want Community Platform to be useful, but we don't want to be an accessory to cyber-crimes. Therefore, some measures need to be taken in order to offer more careful review process which is required to maintain the high quality standard of our Community Platform. Starting from 2019/3/1, all change proposers need to have an active $5/month patronship established through the Patreon platform. This does not guarantee your change proposal will be approved after you become one of the patrons. This is merely a simplified measure to reduce our reviewer's loading and to increase the barrier of change proposal submission. All change proposals are still under the rules specified at "Community Platform proposal and approval guidelines". Please read the rules carefully. If there are any doubts, please use the forum to discuss. We cannot guarantee review timeframes at this particular moment (even if you think you may have "paid" for the service). The fact is, becoming a patron does not mean you're purchasing for a service. It merely means that you are supportive of our causes, and we appreciate that, but it will not bend the rules that have been in the place for several years. Again, if there are any doubts, please use the forum to discuss.